My office has a corporate discount rate through a Belgian chocolatier for Valentine's Day. The candy choices range from $4 hearts to a box of chocolate weighing in at a whopping one kilogram. Yes, you read that right--a kilo of chocolate. The general consensus on my team seems to be "If someone bought me a kilo of chocolate, I'd punch them in the face." Seriously, no joke. As my manager puts it, "I'd rather get jewelry. No calories." 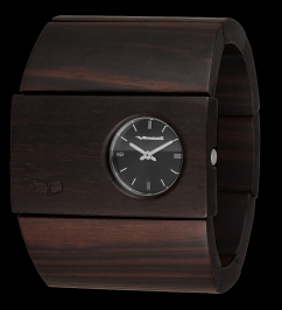 Guys, if you'd rather get kisses of gratitude than flying fists of fury from your girlfriends, consider the Vestal 'Rosewood' bangle watch ($140). Part statement accessory, part timepiece, it's a fun alternative to the classic watch that won't break the bank. The Rosewood comes in different finishes, but my personal favourite is the ebony wood because it looks luxurious and reminds me of the sleek wooden chairs I like to ogle in interior design stores somtimes. What are you getting your sweetheart for Valentine's Day? You know what, my boyfriend actually got himself this watch last week as part of his new Chinese New Year wardrobe. What a coincidence! I never thought of it as a woman's watch at the time, but come to think of it, it would look quite nice in contrast to a sheer pinkish blouse and dark denim! My boyfriend and I don't bother to exchange gifts. His bday is in September, mine in October, then there's Christmas....it's too much so close together. We just go out for a nice dinner-we're trying L'Abattoir this year and I'm really excited. Great watch. I love woody things! ohh I like wooden jewelry, cute. My bf is under a lot of stress right now, so I don't want to put any pressure on him for Vday, so I'm planning to surprise him with dinner. easy and cute. What a great bangle watch! Very stylish! what an amazing watch!! so cool!